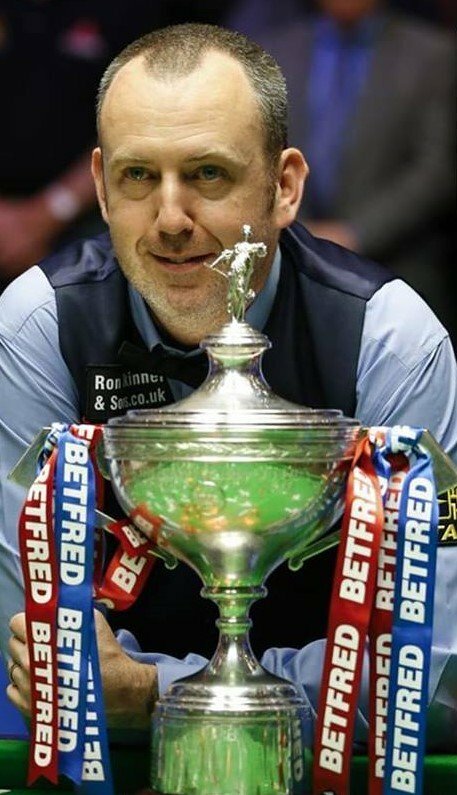 Mark Williams is doing a charity exhibition in Cleethorpes, on April 12, 2019. This was brought to my attention by Nigel Coton, a player competing on both the Disability Snooker Tour and the Seniors Snooker Tour. Thank you Nigel! Food available on the night and a great selection of beers, wines and soft drinks. All proceeds go to health tree foundation trust and special baby care unit. Snooker competition will be held at Ray Edmonds snooker centre on dates to be arranged. £10 entry. Winners will play a frame on the night. Name cards on going to raise funds. Nigel was able to give me a bit more information. As mentioned, the exhibition is in support of the Health Tree Foundation . It is organised by Jamie Barrett, a former pro, who sadly lost his wife 3 years ago far too young. Jamie is from Grimsby, only a couple of miles away from Cleethorpes. As explained above, “Willo” will take on 12 “local” players, including Nigel Coton himself. Nigel can only play with one hand and will (try to) challenge Mark Williams to play him one-handed as well. This is something Mark occasionally does even in ranking events, although only for the odd shot. Here is a recent example. Hopefully Willo will accept the challenge. Should be great!!! If you have the opportunity, get yourself there, have fun and support a good cause! He also gave the fans plenty of time. Ronnie was in Gateshead yesterday for the second night of a three stands tour. Those images were shared on social media. Also this video emerged from Ronnie’s performance yesterday in Halifax, thanks to krdlr who found it! 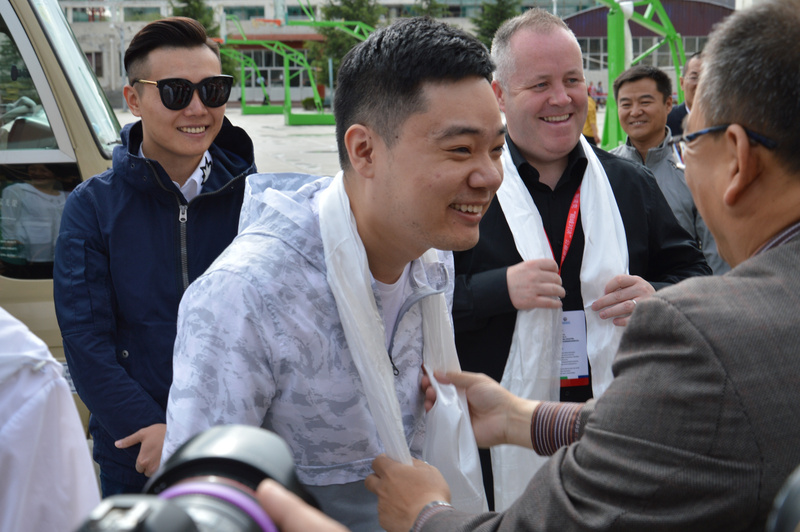 I promised to talk about exhibitions, and these ones, involving Ding Junhui and John Higgins are certainly worth mentioning. 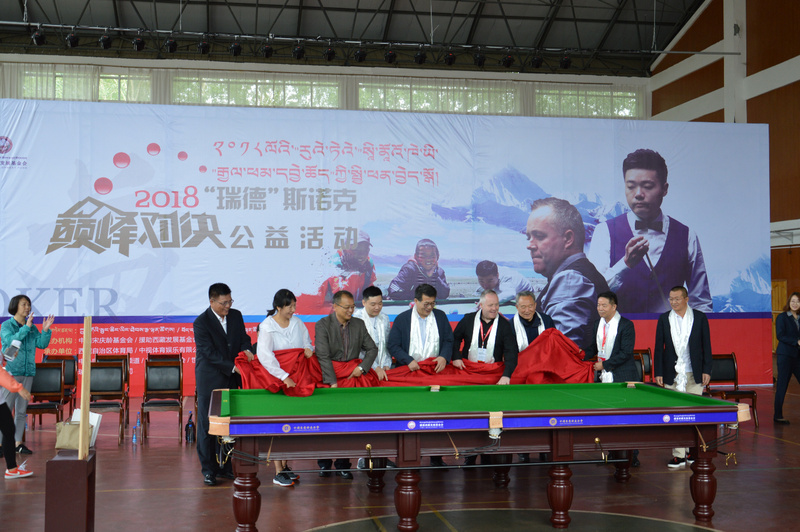 Superstar Online News 2018 “Ride” Snooker “Fighting to the Peak” series of charity events was first held on the morning of June 30 in Beijing Middle School in Lhasa. The event was hosted by the China Soong Ching Ling Foundation and the Tibet Development Foundation for Assistance, the Tibet Autonomous Region Sports Bureau, China Vision Sports Entertainment Co., Ltd., the Lhasa Sports Bureau of the Tibet Autonomous Region, and Daqing Guoyu Culture Media Co., Ltd. Group Co., Ltd. provides public welfare support for snooker events; it is worth mentioning that this is a world-class snooker tournament. Throughout the course of the activity, two snooker star with the same students had a very pleasant interaction: not only quiz on general knowledge of snooker, Ding Junhui and Professor Higgins also personally pitched snooker combat skills, even They also took a counter-attack against the killing. The two star players showed a completely different temperament on the playing field, playing the best of their ability, provoking children’s laughter and screaming, and the scene atmosphere was continuously pushed to a new climax. In addition to interacting, they also donated snooker tables and other billiard equipment to the school. The students on the other side also prepared wonderful performances for the guests. There are not only fashionable modern dances but also Tibetan folk dances. Tibet is known as the “sea of ​​song and dance,” and Higgins from a foreign country was deeply attracted by this beautiful dance. He could not help but take out his mobile phone to take pictures. 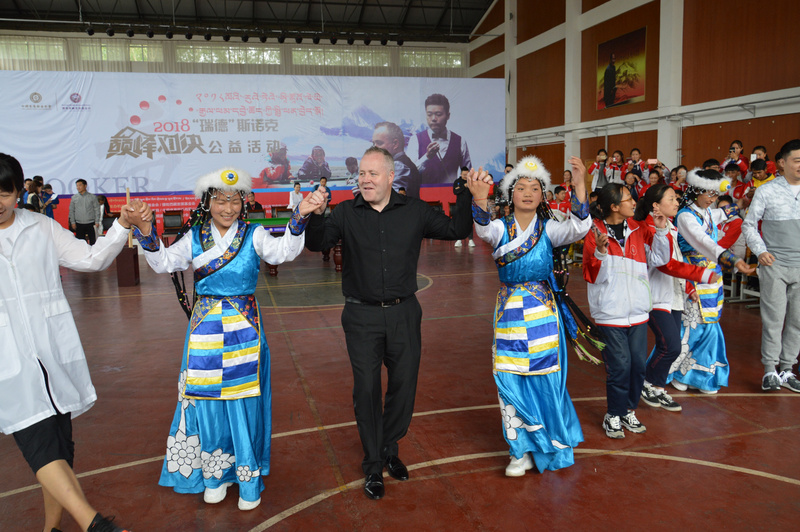 At the end of the event, the enthusiastic children invited guests to join in, so everyone danced in a circle and laughter filled the entire Beijing high school. And there were more images shared on weibo as well. Now, I know that the way China has treated Tibet and its people has not always been friendly and fair, far from it. Things have happened there in the past that were really atrocious, be it about the people’s rights, their living conditions, the crushing of their culture and traditions, the environmental damage and more. But I do hope that as China evolves – even if there is a lot of things that need to be done and improved yet – Tibetan people and their culture will find their right place in the country. I hope – and believe – that initiatives like this one are a sign that we are getting there, or at least closer. So, well done Ding and John. And, just as a reminder, our European past is far from perfect: think Crusades, Inquisition, pogroms, Shoah, colonialism, slavery (including massive deportation of Irish Children to English rules territories in 17th and 18th centuries), countless wars and destructions … Actually our present is far from perfect. Ronnie has now won the Irish Tour 2018 series against Mark Allen as he leads by 4-1 ahead of the last leg to be played in Belfast tomorrow. Here is Conor’s report on the evening. Fifth leg in Kilkenny started off with Ronnie making a century against his amateur. The match against Mark started then and Ronnie had back to back centuries to take a 2-0 lead. Ronnie took the next to stretch the lead to 3-0 and Mark had a fantastic century clearance to reduce the deficit at the interval to just two frames at 3-1. Mark came quickest out of the blocks after the interval taking the next two frames to level at 3-3 which included a wonderful 105 break. Ronnie however got in first in the next two frames with some incredible safety and long potting to close out a 5-3 win with a 137 total clearance and a 98 in the last two frames. John Virgo had prior engagements so the great Tony Knowles stepped in as trickshot maestro and MC. Last night of this tour on Saturday night in Belfast! Once again thank you Conor! And Conor also shared a few images. Thank you Conor! Ronnie and Mark Allen were in Limerick yesterday evening for the third leg (of six) of the Irish Tour 2018. Here is Conor O’Boyle’s report on the night. Conor is the organiser of this tour. Great night in Limerick both players played well. Ronnie went 4-0 up with a century included. Mark came out after the interval and made back to back centuries to make it 4-2. Ronnie then made a great break to win the match 5-2. They decided to play another frame which Ronnie won with another century. It’s 2-1 to Ronnie now in the series with Cork tomorrow night! Thank you so much Conor!